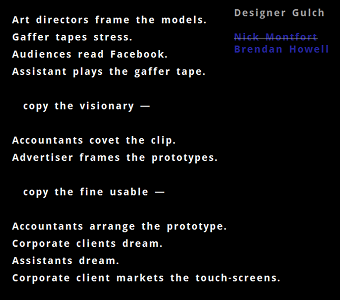 This generative poem explores the design world— populated by artists, models, assistants, photographers, interns, corporate clients, and others shaped by their desires for fame and profit shape their dreams. Conceptualized as a ” a never-ending epic of graphic labor” this “Taroko Gorge” remix was installed at the Berliner Technische Kunsthochschule and it is the first one to respond to user input. In this case, a motion sensor camera triggers a few lines of poetry every time a person enters the building, and displays the poem on two monitors. Interestingly enough, as the very same kinds of people featured in the poem walk in they can read about their ongoing labors, elevated to Sysiphean absurdity through permutation.